Russian officials have said the MS-21 is superior to its Western-made counterparts in many respects. Russia completed the maiden flight of its new MS-21 medium range passenger plane on Sunday. 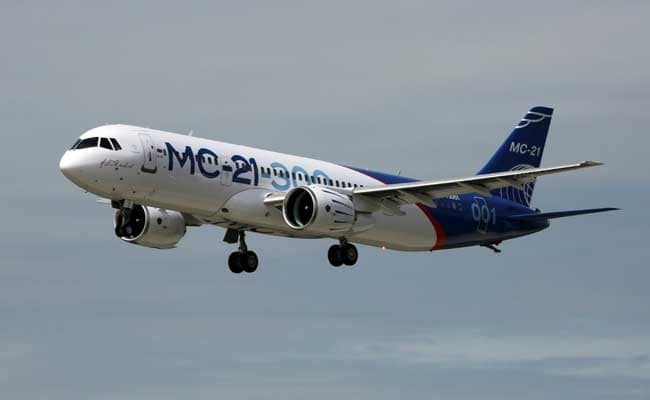 Moscow: Russia completed the maiden flight of its new MS-21 medium range passenger plane on Sunday, its first post-Soviet foray into production of a mainline commercial aircraft which it hopes will rival those of its Western competitors. In a surprise statement, manufacturer Irkut Corporation and its state-controlled parent company United Aircraft Corporation (UAC) said an MS-21-300 model had successfully completed a 30-minute flight at a height of 1,000 metres and travelling at 300 km an hour. The test flight, which was not announced to media beforehand, comes just three weeks after China staged the maiden flight of its new C919 passenger jet, highlighting the growing competition to industry heavyweights Boeing and Airbus. Russian officials have said the MS-21 is superior to its Western-made counterparts in many respects and will be snapped up by both Russian and foreign carriers, but Western analysts says both Russia and China face a huge challenge to shatter the transatlantic airplane duopoly. "The flight mission has been completed. The flight was fine, there were no observations which will prevent further testing," test pilot Oleg Kononenko was quoted as saying. Russia has fought hard to shake its Soviet reputation for old and creaking aircraft flown by inexperienced crews. Flag carrier Aeroflot last year earned its fourth star from independent ratings website Skytrax, ranking it alongside major European and Middle Eastern competitors and ahead of big US carriers such as Delta and United. President Vladimir Putin called Irkut General Director Oleg Demchenko to congratulate him and his employees with what the Kremlin called "a significant event". The twin-engine MS-21 will be built in two variants: the later MS-21-300 which will have 160-211 seats, and the later MS-21-200 which will have 130-165 seats. It is sometimes referred to as the MC-21 when using the Russian name and Cyrillic letters. Production is expected to start in the next two years and state media have said numerous contracts with domestic and foreign carriers have already been agreed. Irkut said it so far had "firm orders" for 175 planes. America's Boeing and Europe's Airbus remain far ahead of their Chinese and Russian rivals, with bigger sales books and more advanced technical know-how. But the new plane could win sales in Russia and some eastern European and Asian countries, industry analysts say, with buyers attracted by its lower running costs. Irkut said operational costs for its new plane will be up to 15 percent cheaper than current generation aircraft. With a range of up to 6,000 kilometres, the MS-21 will be competing against the Boeing 737 and Airbus A320 aircraft which currently dominate the medium-range narrow-body market. Both companies recently upgraded those families to achieve 15 percent operational savings compared to previous versions. State defence conglomerate Rostec, which is headed by close Putin ally Sergei Chemezov, said it had agreed to purchase 85 aircraft. At least 50 of them will be leased to Aeroflot, Rostec said, which currently operates a fleet dominated by narrow-body Airbus models, including 70 A320s. UAC President Yury Slyusar said he estimated global demand for the new MS-21 models at around 15,000 aircraft over the next 20 years. "I'm sure the airlines will appreciate our new aircraft," he said.